In my eternal search for a chutney that’s perfect and has a longer shell life, here comes another chutney that’s good for almost a week, even when stored outside. 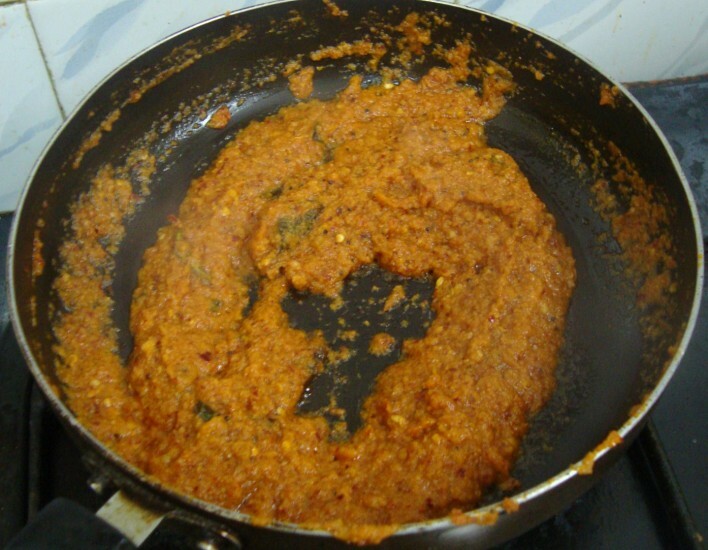 The idea for this came when I was talking to my dietitian and I mentioned that I was forever looking for healthy chutneys that also stays good for a while. 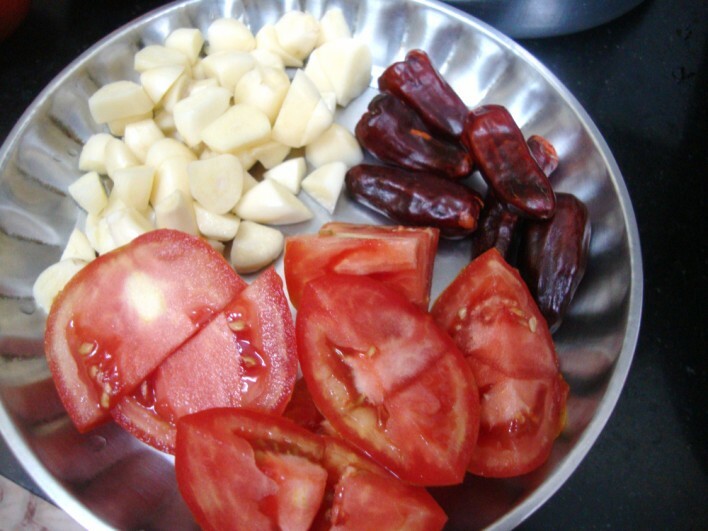 She came out with this idea which was her mom’s, who never used to add tomato. 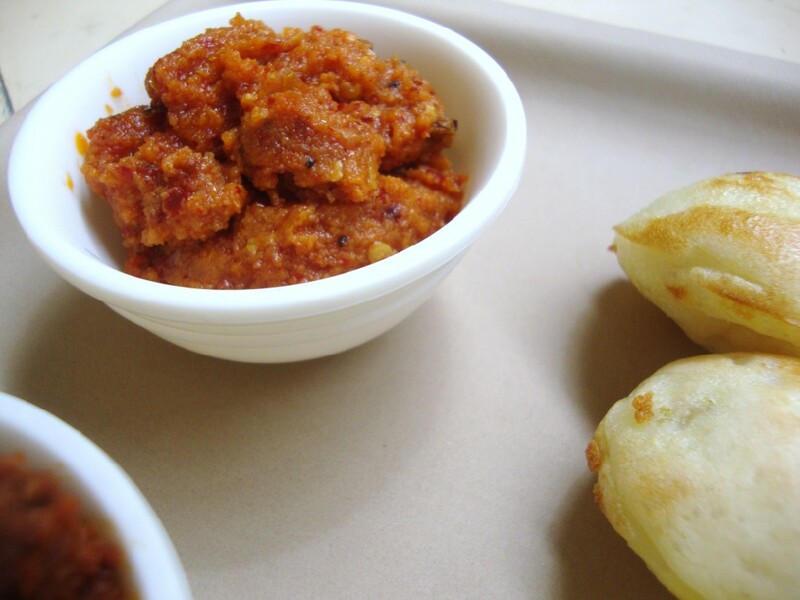 She tweaked and added tomato to make this Garlic Tomato chutney. 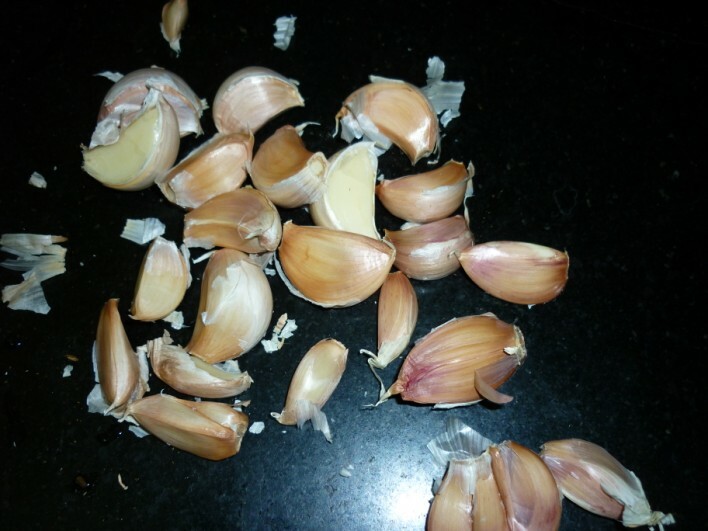 For those of you who can’t actually tolerate so much of garlic, I warn you that this is not a recipe for you. As this has more than one’s share of garlic included. 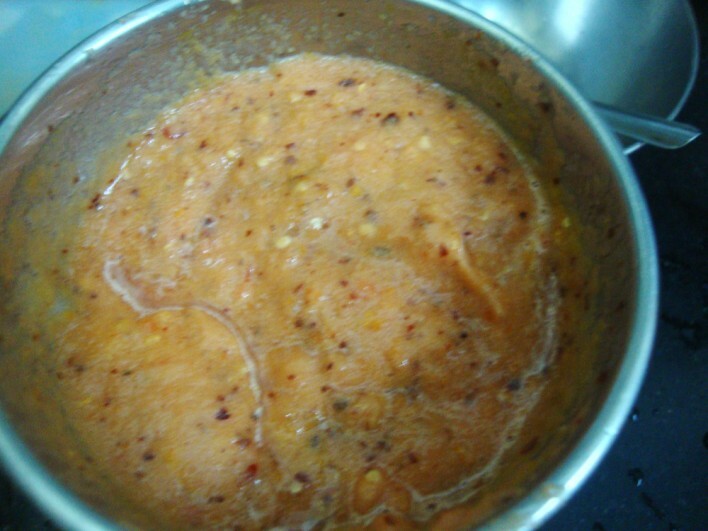 Another new ingredient in this chutney is the fact that I used Sesame oil (also known as gingelly oil or til oil). 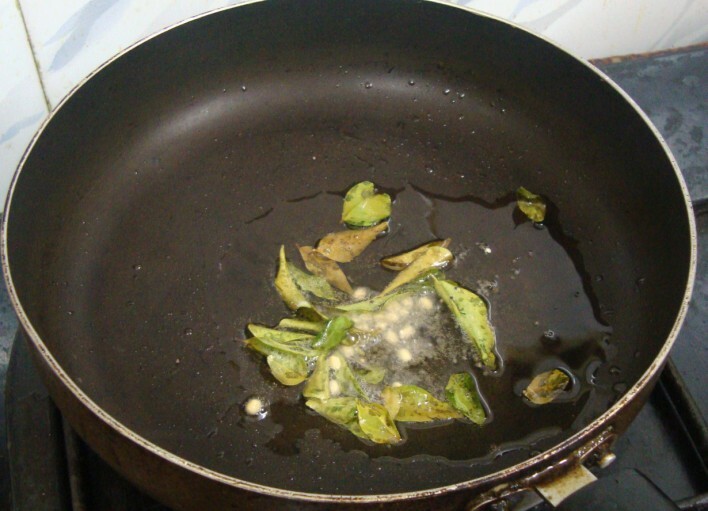 A decade ago, gingelly oil was mostly used in regular cooking. In tamil it’s called Nalla Ennai, in Telugu it’s called “Nuvvula Noone” (Nuvvulu means sesame and Noone means oil) or “Manchi Noone (which means good oil) So you can imagine how healthy this oil was supposed to be. Once the sunflower refined oil hit the market, we saw a decline in the usage of Sesame oil. 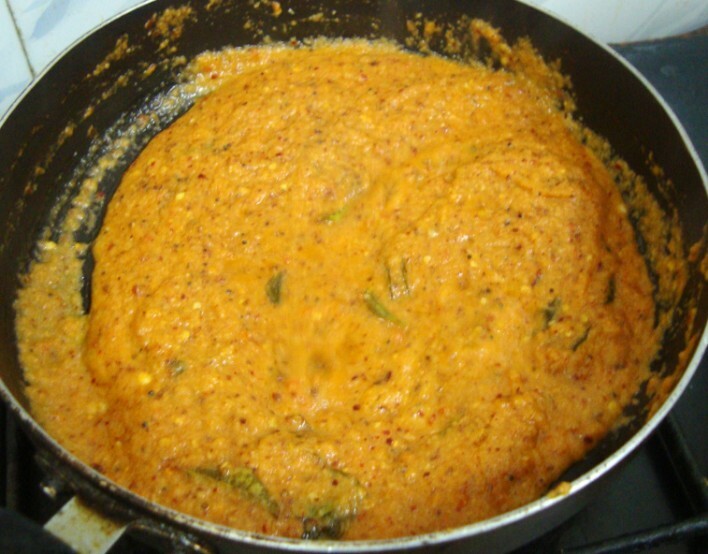 Still for many traditional dishes nalla ennai is still preferred. While I was making this chutney, I remembered the chutney I had in one of the motels we frequent on the NH 45, en route to Tindivanam. 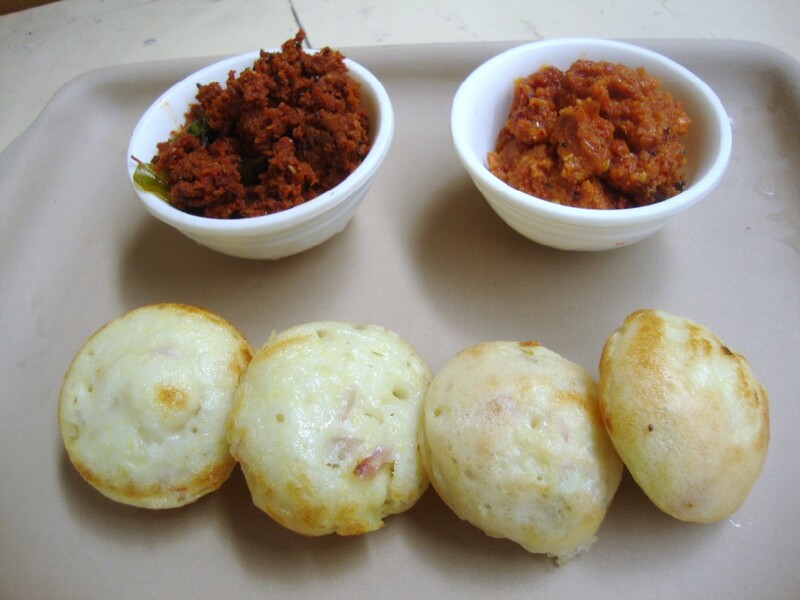 The motel serves about 5 different chutneys with all the breakfast you get in the morning. I don’t remember if I have actually shared the picture will check and update. 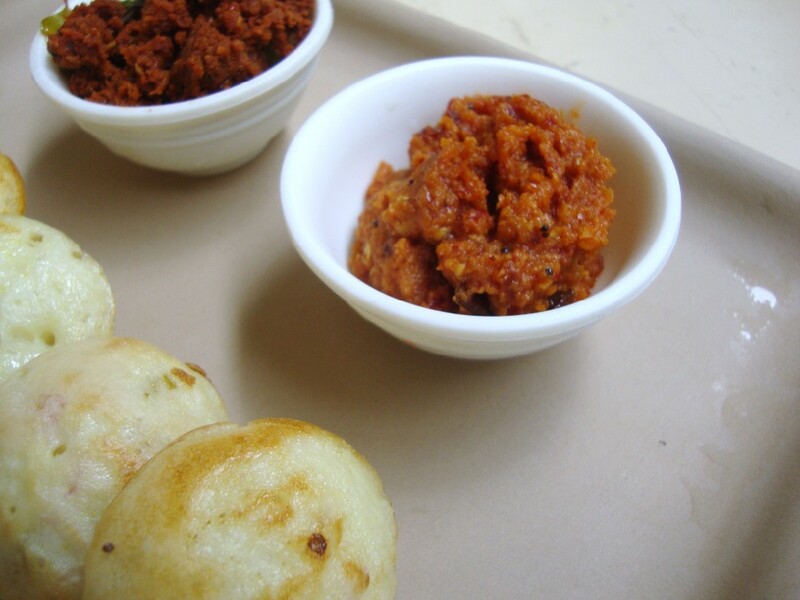 But this garlic chutney is one of them. Though I asked for recipe and tried it back home, I wasn’t able to get the exact aroma or the taste. One of the reason could be that I didn’t use the Sesame oil. So when I was making this, I could immediately remember that smell. So I am going to make it again. Anyway back to the recipe, I served it with dosa and idli for Hubby dear. He somehow didn’t like so much garlicky taste. So we have the whole lot to enjoy ourselves. 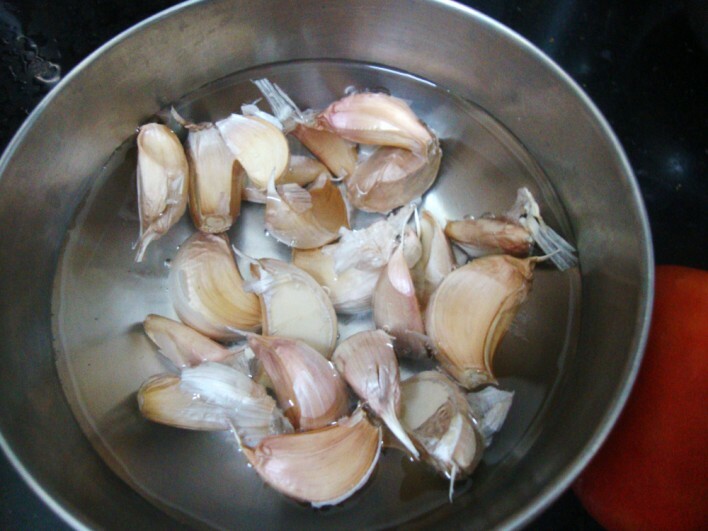 Soak and peel the skin off the garlic. 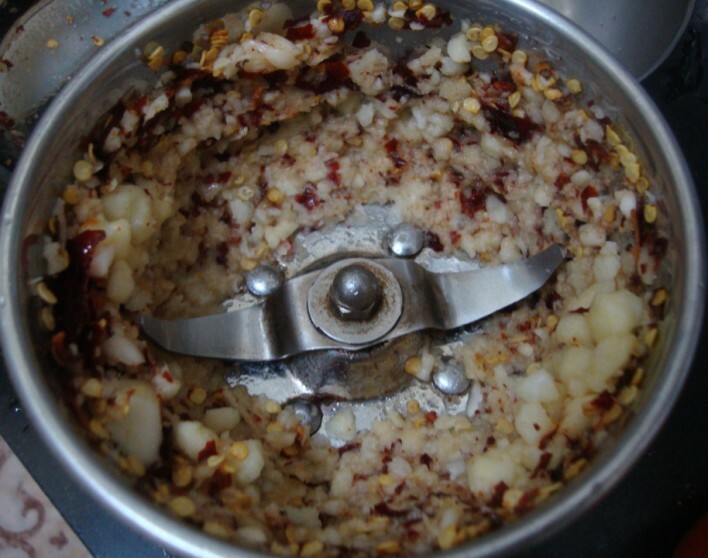 Then in a blender, take the garlic and dry chilies, pulse till you get a coarse mix. Then add the tomatoes and blend to a smooth paste. Heat a non stick pan with sesame oil. Add mustard seeds, Urad dal, curry leaves. When the mustard splutters, add the blended paste. 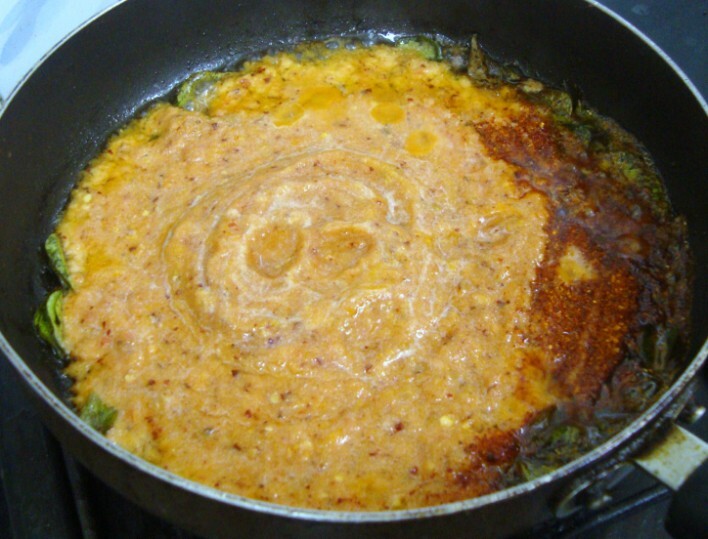 Cook on high for 5 mins, then simmer with lid covered till the oil comes out. 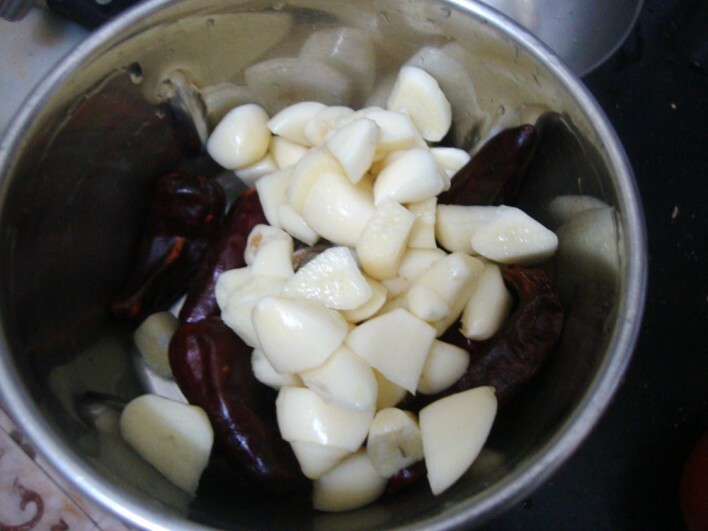 The chutney has to really get cooked well as the ingredients are added raw. You will know when it’s done by seeing the oil oozing out. Notes: Reduce the garlic if you don’t like so many. Since the sesame oil is considered good for health, there is no harm in adding 3 tsps. Also the shelf life will be more if more oil is added. Wowww… looks super delicious and perfect.. yummy !! This recipe is great, i love garlic. It goes nice with some rice on the side. Thanks!